Imposter Syndrome is a struggle almost all of us share. 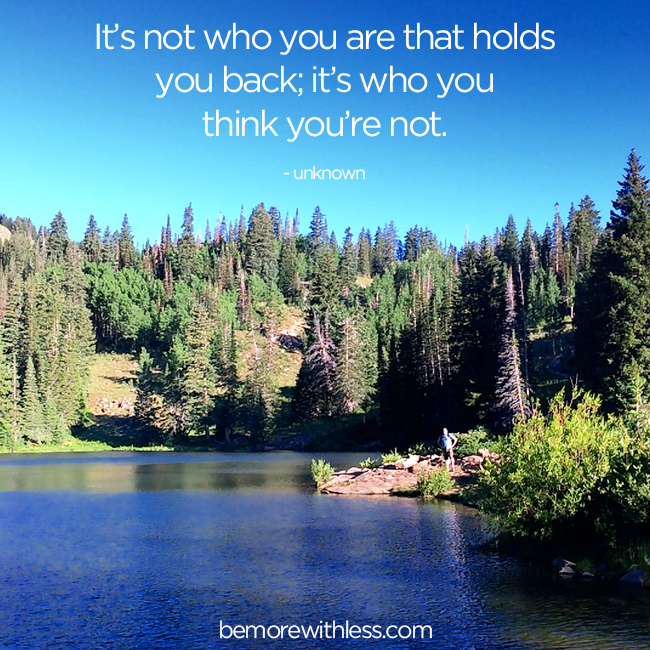 You might call it chronic self-doubt, the fear of being discovered a fraud, or feelings of inadequacy. Even when you’ve already demonstrated that you are more than adequate, you tell yourself you are not. They worry that they aren’t worthy of your attention, worthy of the time and energy they will invest, or if they are worthy at all. They may not talk about it, but they do feel it. I have a conversation about imposter syndrome with 100% of my clients who are facing a transition in life, starting a blog, or sharing their creative work in some way. It always comes up and I understand the pain because I have it too. I know how they feel; how you feel. I struggle with imposter syndrome when I’m writing, speaking, creating something new or meeting new people. When I notice this line of thinking, I try to simplify things so I don’t get carried away with self-doubt. Instead of trying to prove to myself that I’m qualified, or that people care, or trying to talk myself into moving forward, I ask myself one simple question. If we never get to this simple, yet powerful question, our voices are stifled, our hearts remain hidden and our work will never see the light of day. Never asking and answering this question is a disservice to everyone. To you, because you do have something to offer. To the people you want to serve, because they will never know. To beautiful relationships, because your work/heart/offering is pure connection. I don’t ask myself if I’m the only person for the job, or the best person for the job. I don’t ask myself if I have something to offer everyone. I simply ask myself if I have something to offer. When the answer is yes, even a whisper of a yes, I know I have to move forward. When I know I have something to offer, I can’t ignore the call. It doesn’t mean it feels comfortable, or that my inner voice is fully onboard, but I will make the thing, have the conversation, or do whatever I need to do to honor my heart, my offering, and the people it may serve. Is imposter syndrome holding you back from offering something to your life, family, or community? If you’ve silenced yourself in life, work, art, or anything at all, please ask yourself the simple question. “Do I have something to offer?” If you can’t hear the whisper of a yes, put your hands (one over the other) on your heart, take a deep breath, and ask the question again. Once you know, you cannot ignore the call. Brene Brown has done fabulous work studying shame/worthiness issues. Perhaps the most important idea to take from her work is that the only difference in what she calls “whole” people that live fulfilled lives and feel worthy is that they feel worthy. They have learned to deal with their shame and the voice that tells us we are an imposter. The voice in your head is just that – a voice in your head. You don’t have to believe it. Great to hear from you Dan! Brene’s work has done so much to help all of us, and the more we talk about those voices that tell us we aren’t enough, the less power they have. I’ve commented before that your writing sometimes feels as though you’re talking about me. Well I do believe this time you actually are! As you know, I face this issue almost every day, especially now I have re-committed to my blog. The quiet ‘yes’ is the one I have. Like a wee flame that’s all to easily covered by doubt and insecurity, but never really goes out. I need to bring it out, put a glass around it and feed it every day. Thanks for the reminder. You did inspire me Liz! Keep that flame protected. You are doing great work. I struggle with imposter syndrome all the time, both at work and with my blog. I find myself feeling like someone else could probably do my job better, with more credibility and experience. I have to continually tell myself that other people believe in and trust me, which is why I am in the position I’m in. Its a continual struggle. Ali, I think we give it less power when we realize that everyone struggles with it. Keep fighting! When I started my photography workshops business, I used to face this issue, but then I realised that this type of thinking comes from just one problem – our desire for perfection. If we realise that we’ll never reach that point where we’d feel we are absolutely perfect, then the whole effort to become perfect becomes futile. Even when I started my self-help blog just recently, I felt the same desire for perfection – Who am I to offer advice when my own life sometimes seems to lack happiness in certain areas? But I realised if I look at it that way, it’s always going to be the case and I will start to live in fear of being imperfect. And now I’ve come to a stage where I offer advice without any hesitation because I know that I’ll always be imperfect, but as long as my intention is right, everything is perfect for that particular moment of time. Perfection definitely contributes to the problem, but as long as focus on what we have to offer, wherever we are, and remember that perfection isn’t helping to get the message out, we can come back to giving our gifts. So true! I struggle with this a lot at work, on my blog and at school. I think it’s similar to “not good enough” syndrome as well. Thanks for the question! I’m going to write that somewhere so I can see it every day. I felt this a TON when I first stated making video for my blog, but as I’ve gone along I know that most of the confidence actually comes from the act of trying…especially trying something you’re scared of. Each time you build just a little bit more of that muscle that give you just enough energy to keep trying again. It’s also being able to accept failure as part of the equation. You win some, and you lose some. And when you lose, you get back up and try again. I am feeling this now as I am in my last class to begin my second career as a nutrition consultant. I don’t know as much as many people, but I have to remind myself I know enough to help many of them. I have already worked with a number of people who have seen positive health changes as a result of following my advice, so I try to remember that when the doubt creeps in. Ginger, you can help so many people! Congrats on your second career. Timely. Again! Courtney, you consistently offer reflections and guidance that is relevant to my daily challenges, fears and aspirations. So grateful. Imposter syndrome sneaks up on me – love the practical question, do I have something to offer. Thank you. And consider yourself nominated… just completed the Success Mag Blog Awards! Thank you, I needed this especially today. Happy to have this message out at just the right time for you. I love when that happens. I started a new trend in an old hobby because I had not been in it long enough to know how things were “always done” so I did it differently. It still amazes me to see how many people experienced in the hobby followed my new direction. Which proves you can have a lot of impact without a lot of experience. Go ahead; share your new ideas. Way to trail blaze Linda! Have you been spying on my morning pages?! Ha Thank you, and thank you to all of the commenters-I’m not the only one who feels that this post is directed right at me! Hi Courtney – new reader here! This post resonated with me so much. I constantly fall victim to imposter syndrome. When starting new projects, I feel like I’m always bringing myself down with thoughts like, “what can I bring to the table that hasn’t been done before?” When I feel that way, I try to encourage myself by reminding myself that I am unique and I have a voice that is my own. Courtney, I really needed to hear this today. I came to your site because I so often find something fresh and inspiring. I am in the middle of a period of really hard work, I am working full time, studying and looking after my family. I am only a few months from finishing my study and I’m working hard to finish well. But I am struggling and anxious and looking forward to quieter times. Thank you for reminding me I am already enough. I’ve definitely felt this way: before defending my dissertation, when I first started teaching at the university, before starting my blog,and an innumerable number of other times.It happens to all of us. And the question I come back to is very much like yours: Do I have something to say? Note – I entered your blog into the “success contest.” It asked for my name and the name of the blog with a short description. Now I’m not sure if the contest thinks I’m the owner of the blog – geez – hope not – anyway – good luck – you are very inspiring! I clicked on your blog this morning to search for something else and this is the first post that came up. Wow! I’ve been having a horrible round of imposter syndrome all week. It’s like you have been reading my mind. Thank you for this! I love reading all of these comments because it’s such a good reminder that this is very much a universal struggle and that none of us are alone in this. Thanks, Courtney. Excellent article. I think we all struggle with imposter syndrome at some point in our lives. For me personally, blogging is the area where it seems most difficult. Like you said, “Am I the best person to be giving this advice?” You made some great points.